Volkswagen will introduce an all new electric compact sport utility vehicle in 2020, which will be based on the I.D. Crozz concept vehicle. 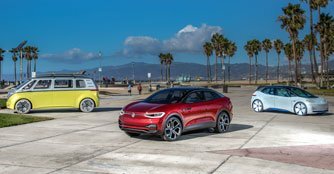 Volkswagen has revealed that it will introduce an all new electric compact Sport Utility Vehicle (SUV) in 2020 based on the I.D. Crozz concept vehicle, which made its North American debut at the 2017 Los Angeles Auto Show. The all-electric compact SUV is expected to precede the revival of the iconic Volkswagen Bus in 2022, with a vehicle based on the I.D. Buzz concept. The I.D. Crozz (centre) joins the I.D. Buzz (left) and I.D. (right) concepts in Volkswagen's EV range The I.D. Crozz and I.D. Buzz, along with the original Volkswagen I.D. concept vehicle, appeared together for the first time in North America at the L.A. Auto Show. The modular electric platform the three vehicles share will underpin all future Volkswagen-branded Electric Vehicles (EVs), and make possible Volkswagen's goal to build 15 different Volkswagen EVs globally by 2025. The I.D. Crozz, first shown in Shanghai in April and updated in Frankfurt earlier this year, carries the future of transportation technology, from its voice-activated doors and trunk to its planned self-driving technology. Sized similarly to the Volkswagen Tiguan in a four-door coupe shape, with the interior space of a mid-size SUV, the I.D.Crozz combines an 83kWh lithium-ion battery pack with a pair of electric motors, one on each axle. The front motor generates 101bhp and the rear 201bhp, for a combined system output of 302bhp. This concept vehicle will offer an anticipated range of up to 483km. The 4MOTION system in the I.D. Crozz uses the rear motor as the default driving force, allowing the front motor to automatically engage when needed for traction, or it can be switched on for off-road use or snowy conditions. The low position of the lithium-ion battery pack also helps to improve handling with an optimum low centre of gravity and 48/52 front-rear weight split. All Volkswagen I.D. vehicles will be designed to speed recharging time over today's models, and the Crozz recovers 80 percent of its charge in 30 minutes via a 150kWh DC charger. The I.D. Crozz features the I.D. Pilot self-driving system, indicated by the red interior ambient lighting when in use The striking design of the I.D. Crozz combines clean and powerful styling with dynamic lighting inside and out. When the I.D. Crozz is 'awakened' it greets its driver and passengers with a 360-degree light show - first, the glass Volkswagen logos (at the front and in the hatch lid) light up in white. Starting from the front badge, a white line develops to the left and right. It passes into the line graphics of the LED headlights, whose individual light elements awake like eyes to welcome the driver. By activating its daytime running lights, the I.D. Crozz signals that it is ready to start. When the electric doors are opened, the sensor fields pulsate, and as the car drives off, these sensor fields are dimmed. The doors also make a dramatic style statement - with front doors that open to an unusually wide 90 degrees, rear sliding doors and the lack of a B-pillar, the Crozz can hold a bicycle sideways behind the front seats. 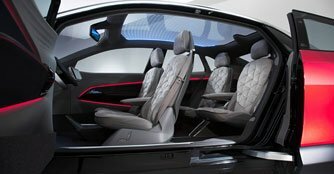 The rear seats offer legroom that's comparable to a luxury car's and fold up when needed for storage. As with the other Volkswagen I.D. concept vehicles, the I.D. Crozz features the I.D. Pilot self-driving system, which Volkswagen plans to deploy in 2025. The I.D. Pilot relies on four laser scanners that pop up from the roof, as well as ultrasonic and radar sensors, side area view cameras and a front camera. 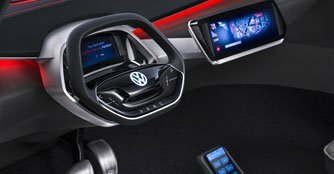 The system activates either by voice control - 'Hello I.D., please activate Pilot mode' - or by intentionally touching the Volkswagen logo on the steering wheel and holding it. After three seconds, the wheel retracts for self-driving mode. In manual driving mode, the ambient lighting in the I.D. Crozz is light blue, while in automated I.D. Pilot mode the lighting switches to red. The interior of the I.D. CROZZ uses an 'Open Space' design concept to create an airy, flexible cabin The interior of the I.D. Crozz uses an 'Open Space' design concept to create an airy, flexible cabin with lounge-like amenities, from the Alcantara-covered quilted seating surfaces to the motion-controlled virtual light shade - a feature of the panoramic glass roof that uses LED strips to illuminate the interior. Drivers can take control of the I.D. Crozz through the electrically adjustable and retractable multifunction steering wheel, an Active Info Display, an electronic rear-view mirror (e-Mirror), an augmented reality heads-up display and digital door panels. These features, depending on their type, are operated by voice and gesture control, touch displays or capacitive button fields. The middle of the instrument panel features a 10.2-inch touch tablet that handles infotainment, HVAC and communications functions. In addition, the I.D. Crozz sports five 'Smart Lights' - interactive, slender LED elements that can communicate with passengers. The Smart Lights in the door panels become active as the driver or one of the passengers starts voice control to open or close one of the doors - a visually supportive element that shows the activation of voice control. Another Smart Light above the Active Info Display in sight of the driver becomes active as the driver says, 'Hello I.D.' At the same time, this Smart Light assists the driver by giving visual cues in the form of interactive light signals in navigation and potentially hazardous situations. For example, if the vehicle detects a pedestrian on the right side of the car, for instance, the Smart Light then points this out with a flashing red signal from this direction.